Crawley Green were twice pegged back by Colney Heath in an end-to-end game on Wednesday night as honours eventually finished even. Kicking up the slope, Crawley had the better of the opening half hour and quickly took the lead after eight minutes as Henry Mungwira picked up the ball on the left, drifted past two defenders, rounded the keeper and slotted home to make it 1-0. After 16 minutes Mungwira again broke clear of the Colney defence but the referee stopped the game due to a clash of heads before he had time to shoot. Crawley quickly followed with a Liam McGovern free kick and two blocked shots from Ashton Grant and Mungwira, before Colney had their first effort, as Lewis Davis’ corner was headed wide by Rey Carbon. Back came Crawley with a blocked shot from JJ Billy which fell to Mungwira but his drive was cleared off the line. Colney rallied before the break and Denielson Vicente fired over from a Davis cross, while on the stroke of half time keeper Dean Bull made a fine save to keep out an effort from Osamu Allman following a Davis corner, with Vicente somehow firing the rebound over. At the start of the second half Crawley failed to learn from their earlier let off and Colney were level after 47 minutes when the impressive Charncey Dash made it 1-1. It was now Colney’s turn to dominate as Crawley had to drop Tom Barnett back into defence following an injury to Luke Fonseca. Colney quickly followed with another effort from Dash which flew wide and after 53 minutes the wayward Vincente headed off target from another Davis cross. Crawley responded with a good run and cross from the left by Aarron Browne which was headed just wide by Billy, while Bull had to be alert to save from Aaron Cato as Dash planted a free kick over the bar too. After 75 minutes Crawley edged back in front though with a goal from new signing Kevin McManus as he produced a thumping header from Grant’s corner. Heath came storming back with efforts from Jamie Eames and Cato which were both blocked before Dash then headed over from a corner, although it was no real surprise when they equalised again on 85 minutes, Dash racing clear to beat Bull. Both sides went for the win in the closing stages and Colney’s Dash fired over from an Eames cross, while Mungwira thought he had sealed the points, only to shoot agonisingly wide following good work from Grant and Charlie Clayton. 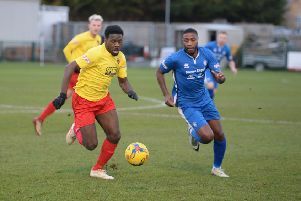 Grant then had a late effort saved by Emmanuel Olayide, before Vincente fluffed his lines in stoppage time as the spoils were shared.